The first light of the rising sun had yet to chase the remnants of the full moon from the early morning sky. A doe browsed in the tall grass in the ravine below me, looking up occasionally with long ears alert to something unseen in the dimness behind her. Ten minutes earlier, she and another deer had charged out of the manzanitas into the clearing. It was far too dark then to be sure, but my guess was that the trailing deer had been a buck. The rut was underway, and this canyon had been full of does all season. Where there're does, there're gonna be bucks. I couldn't ask for better conditions. Only the full moon was working against me, providing the deer with romantic light for an all night dinner. The buck (I had convinced myself that the second deer was a buck) had disappeared, probably into one of the many cuts and ravines, but I kept my eyes on the doe, praying that she didn't wander too close to me before shooting light. If she spooked, that buck would be long gone too, wherever he was. The canyon slowly lightened. Legal shooting time came and found the doe 80 yards below me, grazing toward a well-laden oak which would put her about 40 yards away. The other deer was still nowhere to be seen. I kept the glasses on her, willing a pair of antlers to sprout from her slick skull. I cast every antler growing spell I knew, but nothing worked. She was a doe, through and through, and no amount of mountain voodoo was going to change that. and there he was, topping the rise. He'd grunted at her, "Hey, baby." praying that I hadn't blown it again. Again? Had I blown it before? Haven't we all? Back up the clock to late September, 1996. I'd just moved to California from North Carolina. 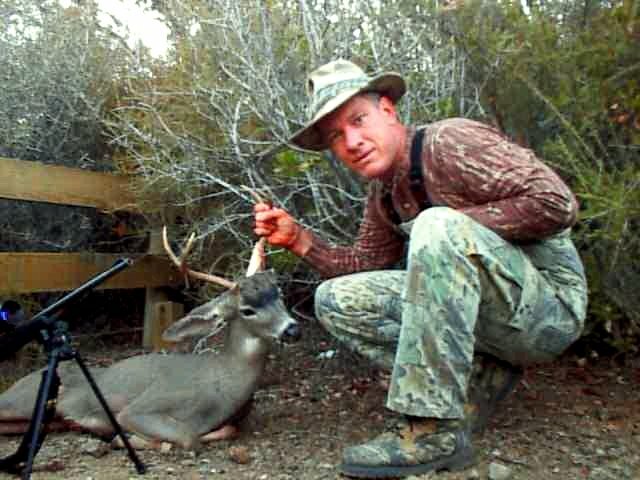 My friend, outdoor writer Dave Campbell invited me on my first California deer hunt. He warned me that deer hunting out here wasn't going to be like Carolina. "We don't have as many deer here," he told me. "You might hunt seasons before you even see a legal buck." Forty five minutes into the hunt on that first morning, Dave had a forked horn on the ground. The canyon Dave showed me that weekend became my regular haunt, and for good reason. An old farmstead in the head of the canyon had left an apple orchard, fig trees, and piles of blackberries and grapevines. Oaks, manzanita, and pines provided all sorts of mast and native berries. A stream ran through the middle of the canyon, providing water. The western wall of the canyon was covered with chaparral, providing incredibly thick cover. In a word, it was paradise. Deer and bear sign littered the ground. I later christened the place "Kokopelli Valley", after a dead tree on a nearby mountain-top, which closely resembled the Native American god dancing with his flute. That name would prove to be portentous. Kokopelli was a trickster in the Native American mythology, a true practical joker. For the next five seasons, he showed me the true nature of his capricious spirit. A week after that first hunt found me back in Kokopelli Valley. At first light, I saw several deer browsing and moving to cover for the day. At around 9:30 or so, I started scouting. Topping a rise I found a hollow at my feet, probably a half-acre in size and green from an underground seep. From the tall grass in the middle of the hollow I saw a pair of long ears. A doe popped up and stared at me for a moment, then looked toward a shadowed area. I made the mistake of taking one more step, and a huge buck exploded from the grass. I unslung my rifle in mid-stride, but in my excitement I was aiming and running at the same time. My shot went wild, and the buck boogied into the chaparral. After an hour searching for any sign of blood or hair, I decided I had missed clean. I had blown it, forgetting everything a lifetime of deer hunting had taught in an instant of buck fever. The season concluded without another opportunity, but I had serious high hopes for 1997. If bucks were, as Dave had told me, so scarce, then this must truly be an awesome place. Two legal bucks in two weeks. . . Missing one deer is not a losing streak. Missing two, however, is an ominous sign. Halfway through the 1997 season I was back in Kokopelli Valley again. It was the mid-morning lull, around 10 or 10:30 and I'd hunted from one end of the canyon to the other, and halfway back again. I was standing in the orchard, out in the open, munching on apples when I caught a movement in the distance. A meadow stretches for about five hundred yards from the apples to a thicket. Nearly at the back of the meadow were four or five deer browsing out in the open. Even at that distance, I could see the rack over the head of one deer. There was nothing between us but one apple tree and then yards and yards of open ground. No way to get closer, I decided to try the shot from where I was. Taking a rest in a fork of the apple tree, I lined up my sights. I was shooting a .243, a good, flat shooting round. I guess-timated the range at about two hundred yards, held high on his shoulder, and squeezed the trigger. I didn't see it hit, but apparently neither did the buck. He looked around at the report, then went back to browsing. I couldn't believe it. I decided I must have held low, and raised the sights to a foot or two higher. My second shot raised dust behind the buck, and apparently a few yards over him. Again, he looked around and went back to browsing. Badly shaken, I adjusted. The crosshairs were wavering now. I took a deep breath and let fly with shot number three. A cloud of dirt and dust exploded about ten feet short of the deer. This time he looked around, and moved to the edge of the brush. He was still looking around when I laid the fourth shot right between his feet. He sprang straight up, his feet never seeming to touch the ground again until he'd disappeared completely into the oaks. As I walked to look for blood, I counted the paces. I lost count around 380, well before I got to his tracks. Being unused to this open-country hunting, I had badly underestimated the range. Again, no blood, no hair. I looked up at Kokopelli on his mountain perch and asked if he'd done that on purpose. "What did I ever do to you?" I asked. By 1998 I had become a fixture at the trailhead to Kokopelli valley. Other hunters knew my truck, and they could count on seeing it there every weekend. Throughout the season I'd seen tons of does, but no bucks. On closing day, I was aggravated. Quail hunters had crashed through every inch of brush and thicket. Other hunters had come hiking through. I'd never seen so many people in the canyon. By 3:00pm, I was fed up. Nothing would possibly hang around after all this commotion. I stalked out, crunching my way up the trail. In the last little clearing, about fifty yards from my truck, a deer stood calmly browsing acorns. The deer lifted his head, displaying a small, forked rack. I checked the antlers through the binoculars, although we were only about sixty yards away. He stood patiently as I lowered the glasses. He looked at me. I looked at him. I slipped my rifle off of my shoulder. Still he stood. I eased the rifle to my shoulder. He watched, calmly. I eased the hammer back with a soft click. He bolted like a rocket. I shot an oak tree. I swear I heard Kokopelli laughing at me. Three seasons, three bucks, three misses. I came to the conclusion that I was jinxed in this canyon. I also decided I needed a bigger rifle. I was afraid that .243 wouldn't leave enough blood sign if I ever hit one at long range. So the 1999 season found me with a new 30-06 and a 4-16x scope. That combination didn't help at all when, after oversleeping one Saturday morning, I wandered into the canyon at around 10:00. I was cursing myself for oversleeping, walking along the old farm road when I spotted a deer crossing in the open. I had only enough time to get the glasses on him and see the antlers when he disappeared behind a hill. I started off in that direction, moving fast but fearful that I'd lost him. No deer would be dumb enough to stay out in the open like that. But as I rounded a bend he came over the hill. Still out in the open, and about 200 yards up. I was in the middle of the road, once again without any cover at all. No rest, nowhere to hide. He froze and glared at me, as if to say, "So, whatcha gonna do?" I plopped down into a sitting position and tried to steady the rifle on my knee. The scope danced around so much I had to turn the power to its lowest setting just to find the buck. My heart was pounding, and the crosshairs jumped with each beat. Four shots later, I had almost calmed down enough to get a good sight picture. Miraculously, the buck seemed unaware that I was the one doing all the shooting. My fifth shot went right under his neck though, and that did it. He bolted, right at me as I fumbled to get the box of shells out of my pack. I gave up and rushed into the field with my pistol. It must have been quite a sight for a moment, to see the buck racing downhill, directly toward me, as I ran toward him brandishing a handgun. If anyone was watching from the hill, they'd have been laughing pretty hard. At about forty yards, I stopped and aimed the pistol. Then the buck disappeared. I shook my head. Then I saw the washout. Then I heard him breaking brush to my left, and turned just in time to see him bound out of the wash and into the woods. No blood, no sign. I couldn't believe I hadn't touched him. It was as if the bullets had been magically deflected. I looked up at Kokopelli with renewed respect. I seriously considered never hunting this canyon again. Obviously, I wasn't meant to take a deer here. My confidence in my marksmanship was shattered. My non-hunting friends all started talking about how my subconscious was trying to keep me from killing a deer. I bought a new stock, added a bipod, and spent hours at the range trying to figure out my shooting problem. I couldn't give up on Kokopelli Valley yet. A half-hour before shoot time, a small deer walked up to the hilltop I had chosen as a stand. I sat paralyzed, as he browsed acorns 10 feet away. As the light came up, I saw the two spikes growing from his head. He was so close that I became nervous. If he spooked that close, what would he do? I drew my 9mm from the holster and held it in my lap. Just after shoot time, the little buck suddenly stopped feeding and looked down the hill for a moment. His ears perked up, and he bolted in the opposite direction. I heard the crunch of leaves as something made its way up the hill toward me. I stealthily moved the rifle to point in the direction of the steps. Then I heard another step, just over my shoulder. I turned to look right into the eyes of a mature buck, less than ten steps away. I couldn't get the rifle around quickly enough, so I leveled the pistol at him. I saw him duck even as I pulled the trigger, and the bullet whacked a manzanita branch where the deer had just been. 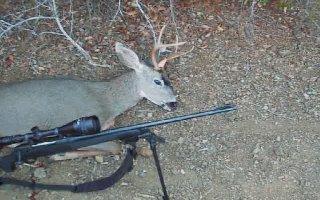 I grabbed the rifle and stood to follow him when a commotion in front of me alerted me to a second legal buck crashing off in the other direction. My first buck had run into some thickets at the base of the canyon, and I followed him in. After about ten minutes of searching, I heard the brush crashing above me and knew I'd jumped him. A moment or two later, I heard a single rifle-shot from the road above. I heard a voice say, "Well, I'll be damned." Five seasons, five bucks, five misses. I was seriously demoralized. My little brother, an avid bowhunter back in North Carolina, offered to ship me some venison when he heard the sad tale. But I also had developed a new determination. I shook my fist at Kokopelli. The apples and the mast were bumper crops this year, and the canyon was literally crawling with deer. Through the next several weeks I saw deer every time I went into the field. They were always does and yearlings, but I knew the rut would bring the bucks back. I had decided not to hunt closing weekend, since the public lands usually become something of a zoo. So the weekend of Friday the 13th would be my season closer. How auspicious. Maybe I should leave my rifle home this time, I thought as I packed the truck. Early Saturday morning started brightly enough. A smallish buck crept out of the canyon below me just before shoot-time. I watched him browse as he went, but he was gone before legal light. I sat tight, hoping to see him again. A doe and a yearling came slowly down the hillside, then slipped into a thicket. The quail were calling as they left the roost, and jays were squawking. It was a peaceful kind of noise. The report of the rifle from the road just above me nearly caused me to lose control of some body functions. I hadn't even heard the guys on the road pull in. A second shot followed, and then silence for a few moments. I heard the unmistakable struggle of someone trying to make their way down the canyon wall, and knew that the shooter had scored. Right behind me too. I listened as the hunter and his spotter discussed where the deer had gone, and finally I got up to go see how they were doing. Obviously the deer had run after it was hit, and I considered going to lend my tracking skills. I decided that I'd go later, if they still hadn't found it, and went back to where I had left my gear on the hill top. As I stood on the knoll, stretching, I noticed a doe on the opposite hilltop, staring at me. Just at the edge of the thicket behind her a heavy-racked buck was also looking at me. My rifle leaned on the bipod five feet away. No way. By the time I got down behind the rifle and scoped the deer, the buck had decided he didn't care much for this activity, and he turned tail and disappeared. I caught one more glimpse of his branching antlers as he stalked over the hilltop and down into another canyon. I cursed myself. I called myself names. I couldn't believe the sorry luck. All I had to do was sit tight. If I'd been where I was supposed to be, and not watching other hunters, I'd have had that deer right where I wanted him. The rest of the day was spent in self-recrimination. That was a trophy buck, and but for a little patience he could have been mine. The jinx was still in effect. I sat until sunset and left the field a little early that night. A pair of does were feeding in the apples, and a couple more were in the long meadow, but light was fading and I had no hope of seeing, much less shooting, a buck. Back at camp I ate a quick dinner and sacked out by 8:30. In my mind, my season was already over. The alarm beeping at 4:00 Sunday morning found me in a different state of mind. Maybe I was resigned, maybe I just didn't care, but I felt pretty good altogether. I dressed and made my coffee, ate my pop-tart, and was back on my hilltop by 5:30. Shoot time wasn't until 6:46 or so, so I laid back and watched the shooting stars until I noticed movement on the ridge across from me. A deer, silhouetted against the rising sunlight grazed the hilltop for a few moments, then wandered back into the woods. A little later, I heard brush breaking and two deer bounded out of the cover into the clearing. Which brings us back to where we came in. The doe stared at me intently, waiting to see me move. I froze, waiting for her to turn her head so I could lift the rifle. The buck, the rut fully on him, had only one thing on his mind. He never looked up when I drew a careful aim. There was no buck fever, no shaking, no nervous breath. I leveled the crosshairs on his chest, just below the throat, and squeezed off my shot. Through the muzzle flash I saw him drop like a wet rag. The jinx was broken. Back at camp, as I raised a toast to my buck, I turned and offered one to Kokopelli as well. He's no monster, but after what it took to get him, it felt like taking a true trophy buck.